Many of these files contain the Certificate, biographical information and signed Oath of Allegiance. this note suggests he has received a duplicate of his Naturalization Cert. ​​We currently hold files for the following, the majority of which are pretty much mini C.V.'s, some handwritten and all signed. Abraham Abraham Theodore Auctioneer at Edmund Jones & Co.
Adamson Capt. C.H.E. Deputy Commissioner & Justice of the Peace. A few of the others mentioned in this file:- Mr Vertainnes, Advocate. D.K. Smeaton, Offg. Chief Secy. to the Commissioner. F.C. Gates, Jr. Secy. to the Chief Commissioner, Sir. H. Thirkell White, Messrs. Gillbanks & Summers, Advocates. Andrews Louis 1884- Very faint – Handwritten signed letter from F.C. Gillbank to E.S. Symes the Naturalization Certificate, signed by H. Thirkell White gives details of his date and place of birth, his profession and abode in Burma, his petition gives his address, age, place of birth, profession, name of parents also his signature, his signed affidavit states more or less the same as his petition. His signed oath of allegiance is also here. Balthazar Carrapiet 1889- His handwritten signed petition for Naturalization addressed to Sir. C.H.F. 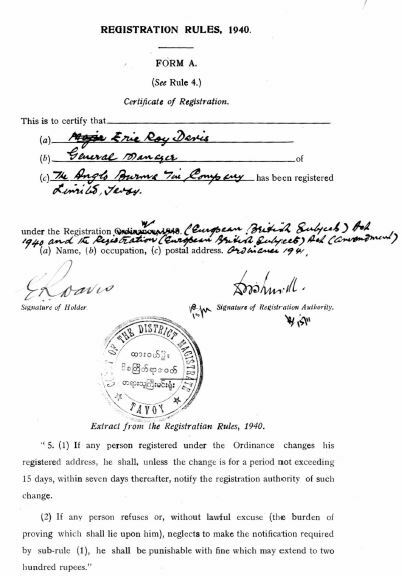 Bruthwaite, states his place & date of birth, arrival date and profession. A handwritten signed affidavit and his Oath of allegiance is also here. Handwritten signed letter of recommendation from G.J.S. Hodgkinson. 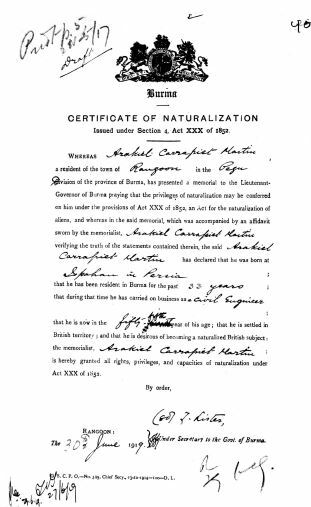 A draft Naturalization Certificate is in good condition and is to be signed by D.H.R. Twomey. Buhmeyer Christian Gottfried Manager of Mohr Bros. Bassein. Danger Wilhelm Carl August 1919- Letter states that he was naturalized in 1900. Typed, signed letter from him c/o Miss Twemlow requests a new Certificate as he is leaving for England. No Certificates or Affidavit. Signed typed letter from him expressing his regrets and requesting the original certificate to be returned. Diekmann B.A. 1868- Handwritten signed letter from Diekmann to Horace Spearman. Handwritten letter to Diekmann from Major H. Nelson Davies, Secretary to the Chief Commissioner, British Burma. Handwritten signed letters from J.T. Wheeler, Asst. Secretary to Govt. of India to Col. A. Fytche, Chief Commissioner, British Burmah. 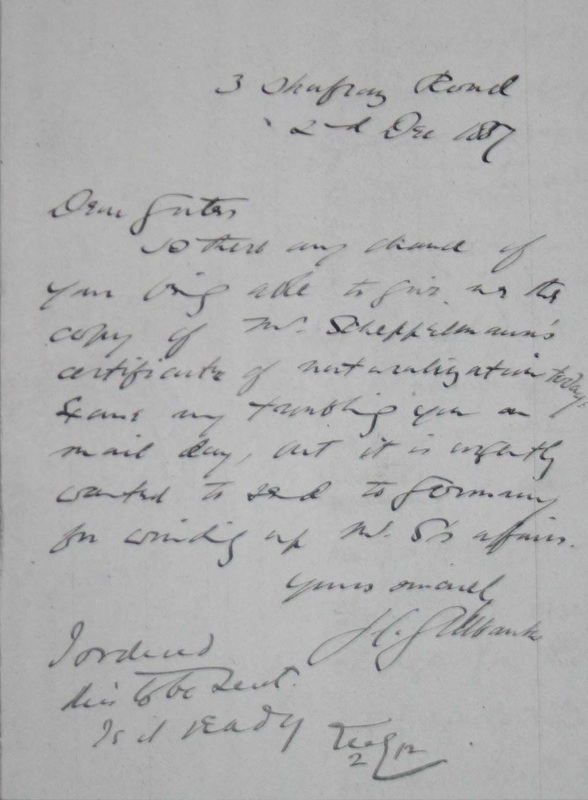 Other handwritten letters request the usual fee to be paid by Diekmann before the Certificate can be issued. Letters only no cert. Fischer Capt. Bernhard 1882- Others mentioned in this file:- Messrs. Todd Findlay & Co., Major M.C. Poole, C.E. Bernard. Green Henry James 1919- Turf Accountant, Rangoon. Letter from Messrs. Lentaigne McDonnell & Clifton and W.F. Rice, Chief Secy. to Govt. gives biographical details for Mr Green.The file also includes his signed petition giving biographical details. Typed, signed letter from W.F. Grahame, offg. Commissioner of Pegu forwarding the oath taken by Green. The Typed Oath of Allegiance signed by H.J. Green dated 20th Oct. 1919 and the Naturalization Certificate is also here. Greenberg Maurice 1866- Handwritten signed letters from Capt. C.P. Hildebrand and W. Muir forwarding the application of Greenberg. No application, certificate etc. Heffner Edward Nelson 1920- American driller employed by Burma Oil. Signed Affidavit from Heffner with biographical details. Typed, signed letter to Mr Lewisohn from M. Keith recommending that Heffner be refused. Signed letter from J.F. Sheeny, Warden of the Oil fields at Yenangyaung, handwritten, signed letter from Heffner’s son H.C. Heffner with biographical details. Jewell William R. 1920- This and the application for Heffner is a combined file. Jewell is an oil well Driller and Field Manager, Yomah Oil Co. at Yenangyaung. Jewell’s case is stronger than Heffner's as he has a British wife. Other letters set out the reasons to refuse (or not) both applicants. Signed Affidavit from Jewell with biographical details. Melosch Christian Louis 1919- L. Melosch & Co. Rice millers. Letters regarding his request for naturalization whilst he is held in a civil detention camp. A separate file holds his typed signed letter stating he had a Certificate in 1894 in Moulmein – letter also gives biographical information and encloses extracts of a letter from 2nd Lt. E.J. Foucar. Letter dated Aug. 1915 from C. Chapman informs him he cannot remain in Moulmein. Copy of his original Naturalization Certificate with biographical details. Passport allowing him to travel dated 1913. 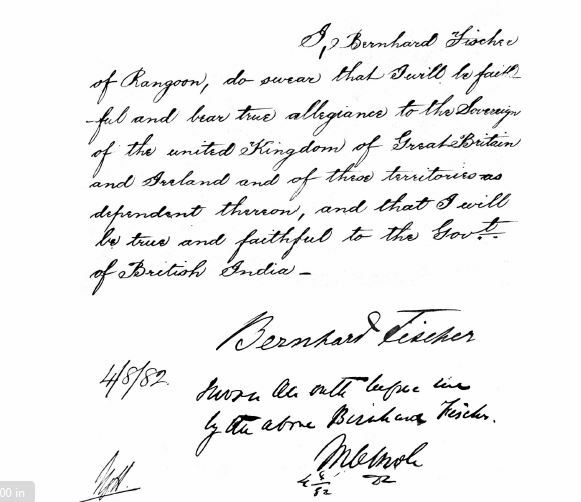 Copy letter from him to W.T. Moore. Vardarian Malcolm Hambartzum 1939- Owner of Malcolm H. Vardarian & Co. Memorial & Affidavit with biographical details as well as the Naturalization Certificate. Wernigg Anton 1884- Very faint and difficult to read handwritten Letters. The Naturalization Certificate gives his date and place of birth, his profession and abode in Burma his signed Oath of Allegiance is also here. Deikmann - - Not naturalized in Burma. Gropper - - Not nationalized. Thain Tau Kyaw Hue - - Not naturalized.